It was a campaign visit that changed history -- and now across the state, cities are marking the 150th anniversary of President Abraham Lincoln's campaign swing through Connecticut. It was not your average candidate visit --- historians say his stops here, particularly his speech in Norwich, cinched the 1860 Republican nomination, reports the Day. Lincoln's speeches were very similar to the rousing anti-slavery speech he had recently delivered in New York. He implored people to examine their consciences and the moral aspects of slavery, according to the Day. On Tuesday night -- that speech will be re-enacted in Norwich and followed with "Lincoln" and his supporters marching to the Wauregan Hotel for an evening of political and patriotic talk and songs. Union Square and lower Broadway will be closed to traffic at about 6:50 p.m. for the parade which will include old-fashion torches lighting the way from City Hall to the hotel. Among the other cool pieces of history on display will be the so-called Lincoln Banner. Dating back to 1860, the banner hung in Norwich's City Hall. It disappeared for more than a century but it was returned to the city after a group of local businessmen successfully bid on it when it turned up at an auction house in New York City in 1997, reports the Norwich Bulletin. Earlier Tuesday, the New Haven Museum celebrated Lincoln's visit with a program that included a mock press conference and one-on-one interviews with Abraham Lincoln, played by actor, Howard Wright of Canton. Lincoln also visited several other Connecticut towns while he was here including Hartford, New Haven, Meriden and New London. 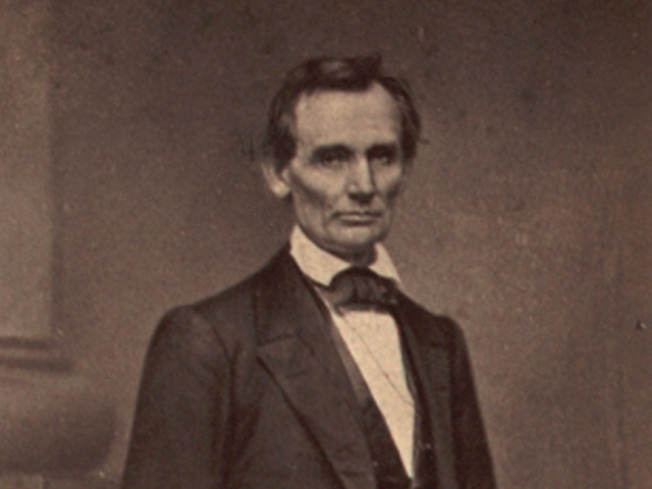 For more on Lincoln's historic visit to Connecticut, click here.